In these, her own words, Hannah Arendt portrays love as that which gives the lover eyes to see the beloved clearly and deeply, such that everything else not only falls away from one’s field of vision, but is completely obliterated. Love, she says in The Human Condition, is destructive of the ‘in-between’ – those individual attributes that disclose our identity and also the common world that we inhabit. However, at the same time as Arendt wrote those words, she discovered within herself profound stirrings of a different kind of love, the ‘love of the world’ (amor mundi). In a letter to her former teacher and lifelong friend, Karl Jaspers, on 6 August 1955, she writes: ‘I’ve begun so late, really only in recent years, to truly love the world … Out of gratitude, I want to call my book on political theories “Amor Mundi”’. [ii] How do we reconcile these seemingly contradictory positions which Arendt takes on love? What is the status of the other person and the world when we love? This question engaged her as she wrote her doctorate on Love and Saint Augustine. Arendt presents two kinds of love in her treatment of Augustine. First, she considers love-as-craving (appetitus), which begins with an experience of lack and is tied to a definite object that sparks the craving itself. [iii] Craving thus provides the necessary drive for the subject to obtain the object, which is perceived as good. Craving is thus a kind of movement and it only ends when the object is attained and enjoyed. However, once that happens, craving quickly degenerates into the fear of losing that which is loved, for even if the object of craving should endure, life itself slips away. Arendt is thus reflecting on the discrepancies and failures in our loving. In love-as-craving we love to the point of self-oblivion and make the beloved and the world an idol. In love-as-memory we truly discover the source of our own being in God but we reduce the world and the other to mere phantasms. In the former, we only see our own craving. In the latter, we see only God, our origin and source. It is not as if her reflections on love are purely theoretical, rather they correspond to specific ways of being in the world. If love is conceived as craving, then the only options available to the lover are hedonism or its antidote, a Stoically-conceived ataraxy, a state of being where one makes oneself immune to the world in order never to feel the experience of loss. If love is conceived as remembering, then the options available to the Christian are a spirituality that is disengaged from the socio-economic and political realities of the world or its opposite, a militant secularism. One way of loving looks to the absolute future, the other to the absolute past; both are an escape into timelessness, neither is engaged with the present. Arendt tries to reconfigure these deficient views of loving. Indeed, in a footnote to the passage that was quoted at the start, she intimates that the problem with love is our very understanding of it. The common prejudice that love is as common as ‘romance’ may be due to the fact that we all learned about it first through poetry. But the poets fool us; they are the only ones to whom love is not only a crucial, but an indispensable experience, which entitles them to mistake it for a universal one. How then does Arendt conceive a proper kind of love, the amor mundi by which the neighbour and the world is loved in all its alterity? 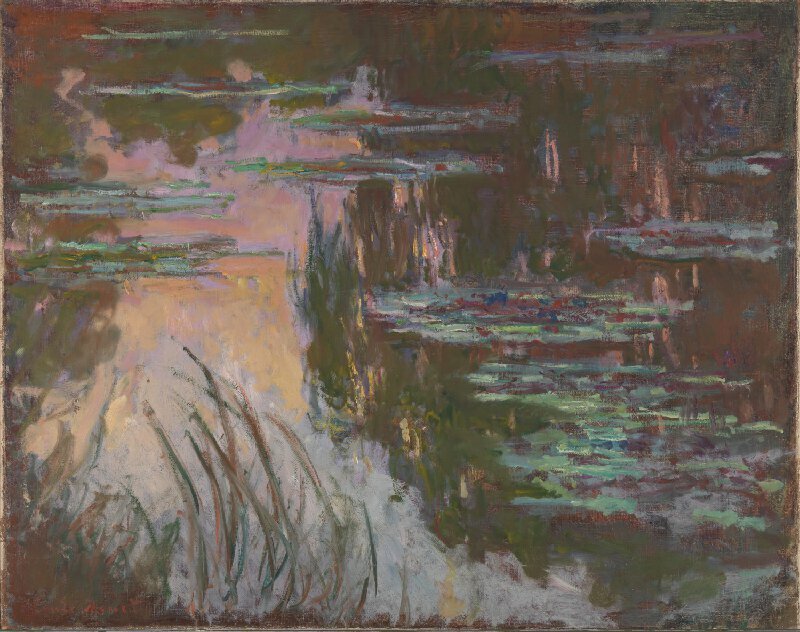 Perhaps what Arendt is trying to invite us to consider can be better understood visually, and I take recourse to Monet’s Water-Lilies, Setting Sun (1907), which hangs in the National Gallery in London. It seems to me that what Monet is trying to do in this painting is to capture a new perspective of the world. He does this by painting the reflection of the pink and yellow rays of the setting sun on the calm waters of his pond in his garden at Giverny, Normandy. In the words of Marcel Proust, Monet accomplishes this astonishing perspective by ‘bending over the magic mirror’ of the canvas. In one canvas, Monet superimposes both heights and depths. Looking at his painting, we see two worlds all at once, without strain, without having to shift our gaze. And we might note that this remarkable perspective is obtained as the painter himself takes on the posture of bending before this beautiful moment in time and space. Arendt’s critique accomplishes a highly sophisticated analysis of the pathologies of loving. She reminds us that there is more in love than just the lover and the beloved; there is this world in between them that must also be cared for, the political space where other actors are present. For a Christian, Arendt’s critique reminds us to take seriously Jesus’s summary of the entirety of the Scriptures: love of God and love of neighbour as of self (Matthew 22:37-40). Like Monet’s painting, Arendt challenges us to see, in all our loving, the other as they are, and to see the face of God in them, never reducing the other to merely a function of our craving or an abstract conception of sameness. Such a vision can only be obtained if we too, like Monet, learn the posture of humility and the letting go of possessiveness before the other. Mark Aloysius SJ is a Jesuit of the Malaysia-Singapore Region. He resides at Campion Hall, Oxford, where he is currently working on a doctorate on the question of desire in Hannah Arendt and Augustine. He is also a member of the editorial board of Thinking Faith. [i] Hannah Arendt, The Human Condition, 2nd ed. (Chicago: University of Chicago Press, 1998), p.242. [ii] Lucy Tatman, 'Arendt and Augustine: More Than One Kind of Love,' International Journal of Philosophy and Traditions 52, no. 4 (2013): 626. [iii] Hannah Arendt, Love and Saint Augustine, trans. Joanna Vecchiarelli Scott and Judith Chelius Stark (Chicago: University of Chicago Press, 1996), pp.9–17.In this paragraph I summarise Arendt’s arguments in her chapter entitled ‘The Structure of Craving’. [v] Arendt, Love and Saint Augustine, p.14. [vii] Augustine, The Trinity, VIII.6.9. [viii] Arendt, Love and Saint Augustine, p.51.This is where Arendt distinguishes herself from her mentor and lover, Martin Heidegger, who claims that the self in the world (Dasein) is a Sein-zum-Tode: ‘being towards Death’. [x] Arendt, Love and Saint Augustine, p.94. [xi] Ibid., p.95.Here Arendt is quoting Augustine’s Homilies on the First Epistle of John, VII.10. [xii] Hannah Arendt, The Life of the Mind (New York: Harcourt Brace Jovanovich, 1978), Vol. II, p.104.